There are some universally acknowledged foods that go together: chocolate and peanut butter, strawberries and champagne, French fries and ketchup, brie and rose petal jam. Haven’t tried brie and rose petal jam, you say? Well, ma chère, let me school you, because this taste sensation is going to change your life. If you haven’t noticed yet, I am partial to anything rose flavored. I had my first encounter many years ago at the famous Hollywood ice cream shop Mashti Malone’s. The moment I tasted their rosewater ice cream, I was forever hooked on anything rose. I bought some rose extract and started adding it to frosting, cocktails, ice cream…my husband wasn’t thrilled, but I was! Rose, rose, rose! And more rose! One day, I stepped into a local Armenian market in my neighborhood. I love finding treasures in tiny ethnic markets; you always find something delicious that you never heard of. 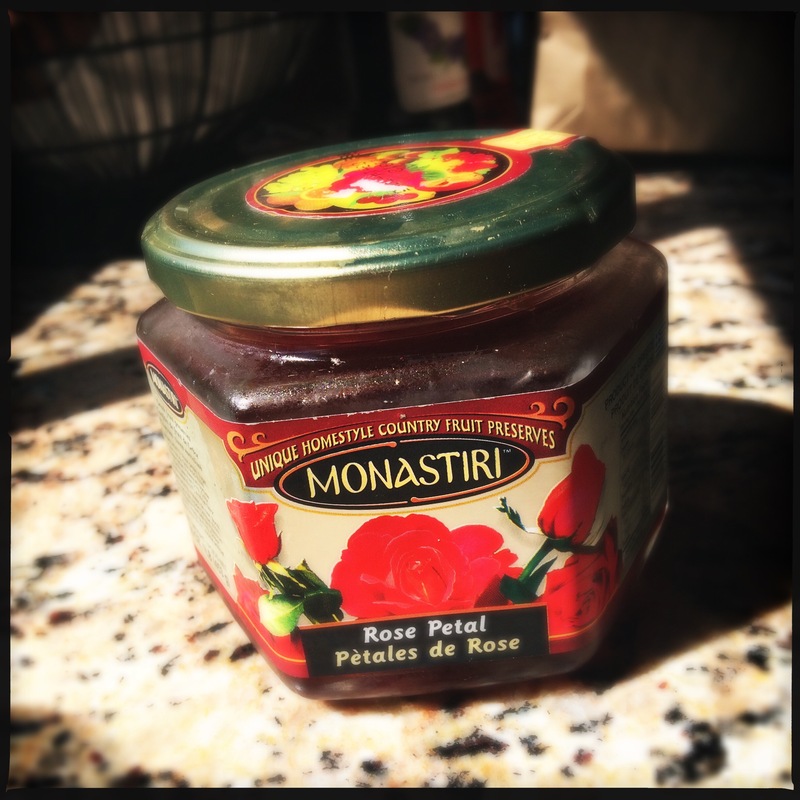 When I saw the rose petal jam on the shelf, I honestly did swoon with delight. There were a few different types. Some were very light-colored with nearly transparent petals that floated inside the jar like clouds. Some were bright pink and thick. And others were somewhere in the middle. I bought one of each. Once I got the jars of jam home, I wasn’t sure what to do with them. I tried some on toast, but it was way too sweet and, even though the rose flavor was balanced and floral, toast was not the right foil. I tried making rose macarons, and used the rose petal jam as the filling. 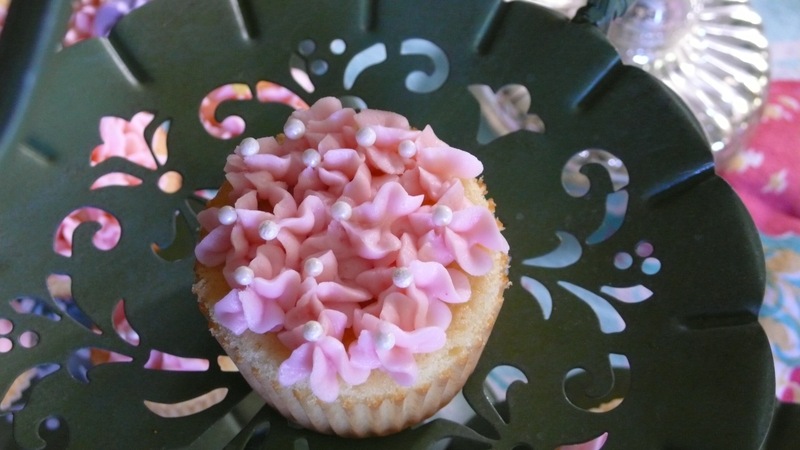 They tasted amazing, but the jam oozed out of them, making a rose-flavored mess. Around this time, fig jam and quince paste was all the rage on a cheese platter. One day, as I was preparing my same old platter, the brainstorm hit. The moment I had my first cracker, brie, and jam bite, I knew I had found appetizer nirvana. The sweetness of the jam complemented the creamy richness of the cheese perfectly. Add the crunch of a cracker to that and, mon Dieu, you will be hearing angels singing Edith Piaf and your mouth with will be swirling with a bouquet of delicate and buttery flavors. You will have no other choice but to repeat this process again and again until all the jam and cheese are gone. 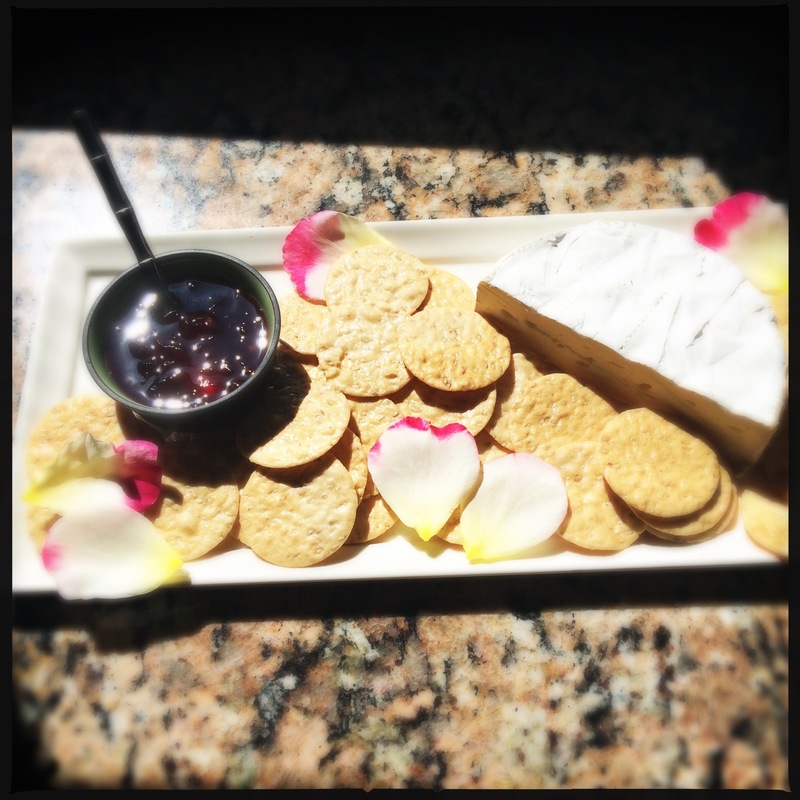 Rose petal jam is now a frequent guest on my cheese platters. I would put it on every platter, but I feel bad for my poor husband, who wishes I were obsessed with peanut butter or hot sauce instead. It also makes a great hostess gift. I prefer the darker jams, as they seem to have a more intense rose flavor, but you really can’t go wrong. Give your heart and soul to me, o’ rose petal jam, and life will always be la vie en rose. You can find many different brands of rose petal jam at Amazon. For the record, I actually DO like the rose jam and brie mash-up. Just goes to show: cheese trumps all.